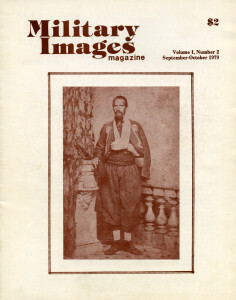 The cover of this issue features an unidentified Zouave of the 155th Pennsylvania Volunteer Infantry, who was wounded in the left arm at Chancellorsville. The editor of Military Images responded to the many positive responses for the first issue and thanked the readers. Some concerns that readers identified were addressed, and the procedure for the submission of articles was outlined. Changes in the format of this specific issue (in order to accommodate the article by Joseph G. Bilby) were explained. This interesting article discusses the development of the dynamite gun, which used pneumatic pressure to fire explosive projectiles. Beginning with experimentation with an existing design, Capt. Edmund L.G. Zalinski worked with Pratt & Whitney on the project. He later found that changing the design of the missile made the weapon more effective; these changes were later seen in the design of the artillery shells used in tank-killing bazookas of World War II. Zalinski also developed an electric fuse that was used with the system. Eventually his design was adopted by the U.S. Navy and placed in the gunboat Vesuvius in 1890. The issue of accuracy was raised, as the guns were fixed; the ship itself had to move around to aim the dynamite guns. The article includes two images of the Vesuvius, with the dynamite guns which were proven to be an effective weapon during its use in the siege of Santiago in the Spanish-American War in 1898. An excerpt from his upcoming book, Trampling Out the Vintage: The Story of the 15th New Jersey Infantry, the article begins with the descriptions of two group photographs taken in March 1864. One was of the line officers of the 15th New Jersey and the other was the NCOs and First Sergeants. The article goes into detail on the stories of many of the identified men from both images during the May fighting known as the Battle of Spotsylvania. The article is accompanied by five individual images, along with more extensive narratives of their experiences. The article gives the reader a very good sense of the destructive nature of the spring 1864 campaign outside of Richmond. The author of this enlightening article provides a short history of the Zouave, beginning with the French Army in North Africa. While variations in uniforms grew, the Zouave regiments became effective light infantry units with the reputation of sharpshooters throughout European militaries. Their adoption by American militia companies, most notably the Zouave Cadets of Illinoisan Elmer E. Ellsworth, came in 1860, just prior to the outbreak of the Civil War. The author stresses that American Zouave uniform was generally a fanciful variation of the North African uniform although some authentic versions existed. hey varied widely from regiment to regiment, which is illustrated with one large group image and six individual soldier images, which the author uses in his discussion. 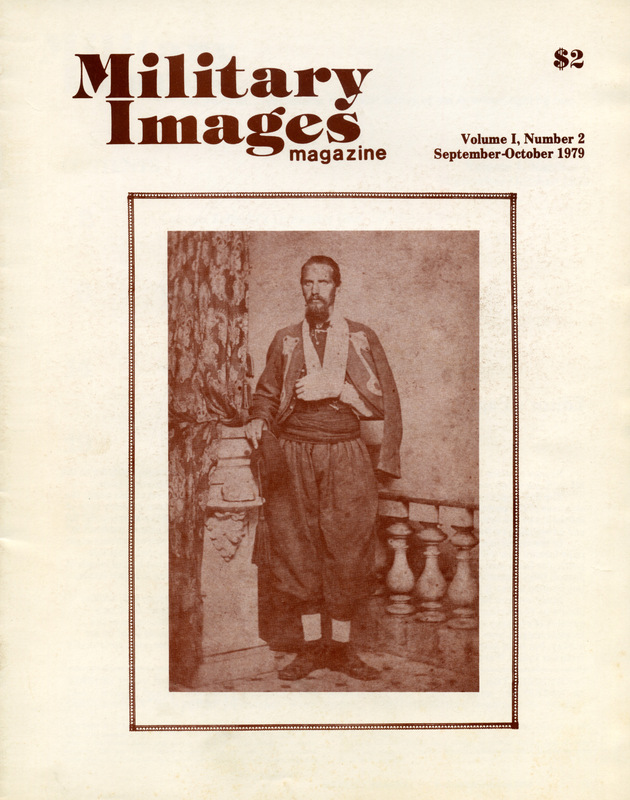 The author advises collectors of Zouave images to take care that they do not dismiss images of individuals wearing standard Civil War uniforms, as they may have belonged to named Zouave regiments. He included an image of Capt. Thomas Skelding of the 10th N.Y.V.I. (the “National Zouaves”) who was wearing a frock coat with long skirts. The uniform of the Chasseur is also not to be confused with the Zouave; the indicator is the length of the skirts on the jackets, which were between 6 and 12 inches. Officer uniforms would sometimes vary from the unit’s enlisted men, and the use of the Zouave uniform did continue past the Civil War as well. The author of the previous article showcases 48 different carte de visite images of individual soldiers wearing Zouave uniforms. This includes Col. Elmer E. Ellsworth of the 11th New York Volunteer Infantry, who popularized the Zouave uniform in the United States. There is also a carte de visite image of Francis E. Brownell, wearing a different type of Zouave uniform; Brownell shot the Alexandria, Virginia hotel owner who killed Col. Ellsworth at the start of the Civil War. Many of the soldiers wear veteran sleeve stripes or corps badges, indicating that the Zouave uniform was worn continually throughout the war. This short article describes the intense fighting engaged in by a number of infantry units from Pennsylvania’s 28th Division during World War I in August 1918 in France. Defending the town of Fismette on the Vesle River, the regiments came up against heavy German fire, including gas, extended artillery bombardments, and frequent hand-to-hand street fighting. The focus of the article is on the activity of the 110th Ambulance Company, which evacuated over 500 casualties. The grandfather of MI’s editor, serving in the capacity of wagoner, was a recipient of the Distinguished Service Cross and is pictured. Pictured here is Eugene Beaver of the 4th U.S. Cavalry, D Troop, is pictured on January 24, 1899. He served in the Philippines, where he contracted malaria and chronic dysentery, prompting his medical discharge in 1901. He returned to service in 1903, enlisting in the Marine Corps under a different name; he was honorably discharged in 1907 and died in 1910 at the age of 36.